Lightning's Girl: February 16th, 2012 : Cause & Effect : Leonard Cohen. 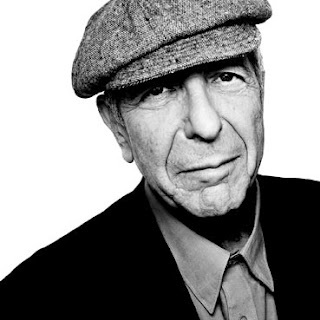 February 16th, 2012 : Cause & Effect : Leonard Cohen. The one and maybe only perk to being unemployed is having the extra time to dedicate to my radio show. This has afforded me the opportunity to spend something like 20 or 30 hours preparing for this Leonard Cohen show, time a man of this kind of legend deserves. In his 77 years on this planet, more than 60 of them have been spent dedicating himself to creating art; be it as a poet, a novelist, or singer/songwriter. He has traveled the world, thought deeply about the human condition (as only a poet can do), and given his life experiences a voice that resonates like a whisper of a sage directly into your ear. He is a fascinating individual filled with curious and surprising inspiration. This in turn made for a highly unusual Cause & Effect filled with religious overtones (Judaism and Buddhism), fellow writers, Country & Western stars, jukebox heroes of the '50s, and a cast of followers who treat Cohen more like a deity than a fellow artist. (And as an interesting side note Cohen's surname is derived from the Hebrew word for priest). Lou Reed while giving the speech at Cohen's induction into the Rock and Roll Hall of Fame in 2008 described Cohen as belonging to the "highest and most influential echelon of songwriters". Hallelujah. If you don't know or appreciate Cohen, your missing out on one of the most beautiful mirrors life has to offer. Download the show in full here. The set list all two hours is here.